Hydrogels are becoming more and more popular as platforms for three-dimensional (3D) cell culturing. 3D hydrogel matrices have been used for a variety of applications, including tissue engineering of micro-organ systems, drug delivery, cytotoxicity testing, and drug screening. 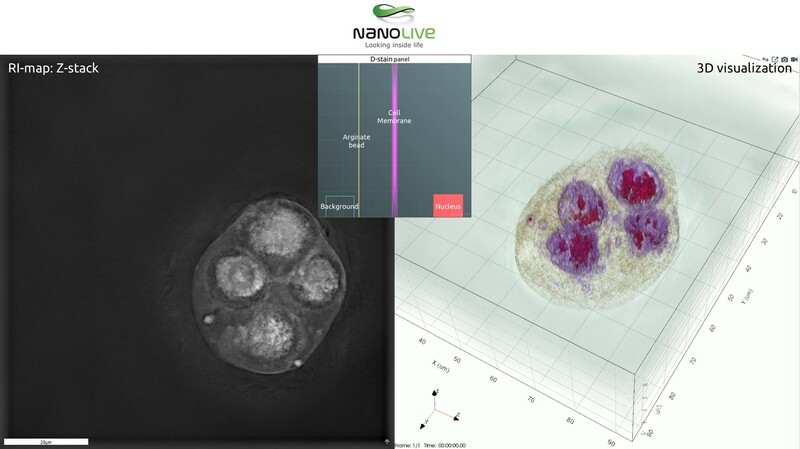 Moreover, 3D cell cultures are applied for investigating cellular physiology, stem cell differentiation, tumor models and for studying interaction mechanisms between cells and the extracellular matrix. Engineered 3D extracellular matrices (such as gels and hydrogels) have been recently confirmed to have a very significant role in cell reprogramming, becoming a main actor in the generation of iPSC (Induced Pluripotent Stem Cell) as published in Nature by Matthias Lutolf’s lab here at EPFL. Immunofluorescence combined with confocal microscopy is one on the most common ways for the study of cells embedded in 3D gel matrices. Nevertheless, the gel matrix can reduce the accessibility to chemicals, affecting the efficiency of permeability and increasing the needed amount of antibody and incubation time; the interaction between the 3D matrix and antibodies could also result in mislabeling, producing a non-specific signal. 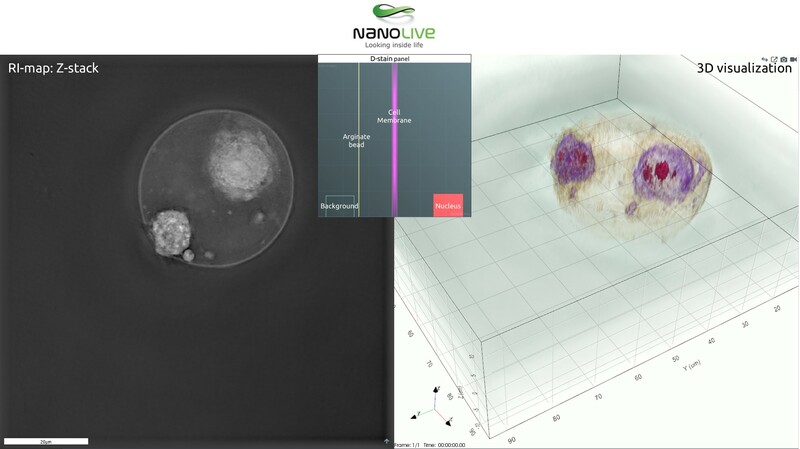 Nanolive’s 3D Cell Explorer surpass these limitations allowing for fast and reliable imaging of cells embedded in alginate spheres with no chemical staining! a. HeLa cells encapsulated in alginate beads suspended in DMEM solution and visualized through a glass coverslip. The alginate beads were generated using sciDROP PICO technology mounted on a sciFLEXARRAYER S3 (SCIENION AG, Germany). b. & c. 100 μm-diameter agarose microgels encapsulating mESs (mouse embryonic stem cells). High-throughput combinatorial cell co-culture using microfluidics, 28 Apr 2011, Ethan Tumarkin et al. HeLa cells encapsulated in alginate beads suspended in DMEM solution and visualized through a glass coverslip. The alginate beads were generated using sciDROP PICO technology mounted on a sciFLEXARRAYER S3 (SCIENION AG, Germany).